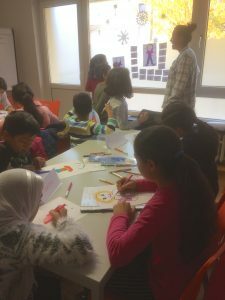 Last week we started a new project to offer English Tutoring and Homework Support to refugee children ages of 7 to 12 living in the refugee camp in Hanau, Germany. The classes are running twice a week and the children attending are from countries such as Pakistan, Iran, Afghanistan, Syria and Palestine. The project was implemented with the support of the Hanau Camp management team, and classes are offered at the community centre inside the camp. It all started with football. After the successful football event offered to the refugee children in Hanau last month, our All4Aid Managing Director, Rodrigo Assis da Silva, met with the management team of the Hanau Camp. The goal was to hear more about their needs and explore ways that All4Aid could support them. English Tutoring and Homework Support for the children was quickly identified as a big need and a good way to continue to develop the relationship with the children we reached out through the football event. If you would like to volunteer on this project, please click here to see a list of our volunteer projects and find out more information. The tutoring takes place every Tuesday and Thursday, from 14:00 to 17:00. You don’t have to be a professional teacher to join, anyone who speaks good English and has a heart for refugees should be able to help!